The 4th of July is a favorite summer holiday that celebrates our independence, and cities big and small all across our country celebrate it. While many places all over the country have great events with parades, activities, and fireworks, there really is only one place to be on our country's birthday. Washington DC, the nation’s capital is one of , if not the best place to experience the celebration of our country's birthday. While most cities around the country will hold their July 4th celebration on the weekend closest to the holiday, Washington DC celebrates on the actual day, regardless of the day of the week. The Independence Day Parade kicks off the celebration at 11:45 a.m. The parade follows a route along Constitution Avenue in the Capitol Hill area and includes everything from marching bands to floats and military units. 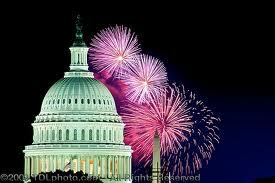 After the parade there are plenty more daytime activities to make the Washington DC 4th of July celebration special. The Smithsonian Folklife Festival takes place on the National Mall from 11 a.m. to 5:30 p.m. and features music, dance, cooking demonstrations, and crafts. The National Archives building puts on a special program about the signing of the Declaration of Independence, open from 10 a.m. to 9 p.m. The White House visitor center also offers entertainment from 9 a.m. to 3 p.m. which includes games and crafts. Starting at 6 p.m., there is a concert on the Washington Monument grounds featuring the U.S. Navy Band. Located on the southwest corner of the monument, this concert goes on until 9 p.m. The National Symphony Orchestra performs “A Capitol Fourth Concert” which is held on the West Lawn of the U.S. Capitol building. This is a free concert and is open to the public and gets started at 8 p.m. Several pop artists will also be there performing patriotic music as well. After the concert finishes, the annual Fireworks Spectacular starts. The Fireworks kick off around 9:15 p.m. at dark. The Fireworks are launched from the reflecting pool in front of the Lincoln Memorial and light up the sky above the Washington Monument in spectacular fashion fitting for such a grand celebration. The 4th of July is one of the most popular times of the year to visit Washington DC, which means that hotels will be cramped. If you plan to celebrate America’s birthday in the nation's most iconic city, then you need to plan ahead and do your research. Even with the time closing in you can still find a condo to rent. Renting a condo can take some of the hassle out of your vacation and save some money by giving you and your family enough room to stretch out and relax after a day of sightseeing. Having a kitchen can keep your costs down by allowing you to cook some of your meals yourself rather than going to a restaurant for every meal. What better way to spend a memorable 4th of July in the middle of all the history and pride. $298 - Two- or Three-Night Stay at The Dupont at the Circle in Washington D.C.